A fungal disease which affects the leaves of daylilies. It is caused by Aureobasidium microstictum*, however an injury to the plant may be required for infection to take place – pest damage, for example. 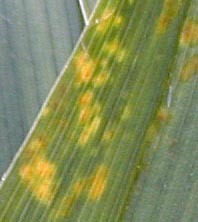 Symptoms include yellowing along the central leaf vein followed by browning, and reddish-brown spots. 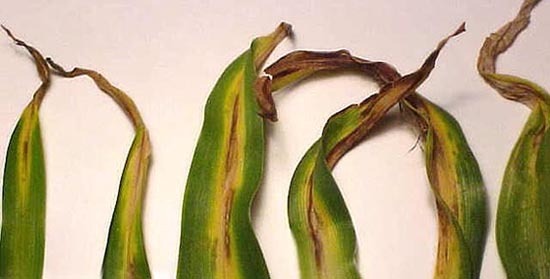 The damaged areas may join together and spread along the leaf in streaks, and infected leaves may eventually die. 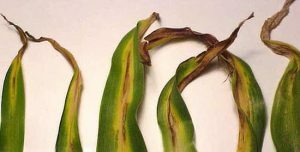 Cultivars vary in their susceptibility to leaf streak. Minimize overhead watering and avoid working among the plants when the leaves are wet. Above photos by Doug Maxwell, used with permission. Photo below is by Sue Bergeron, used with permission. Note below that the affected part of the leaf is the center midline vein then outward as the disease progresses. *Aureobasidium microstictum is the current name given to the daylily leaf streak fungus, but it has had several name changes and may be listed in literature as Kabatiella microsticta, Gloeocephalus hemerocalli or Collecephalus hemerocalli. “Control of Leaf Streak on Daylilies with Fungicides” by Kirk et al.